Give your bedroom decor an elegant update with this lovely 3-piece duvet cover set. 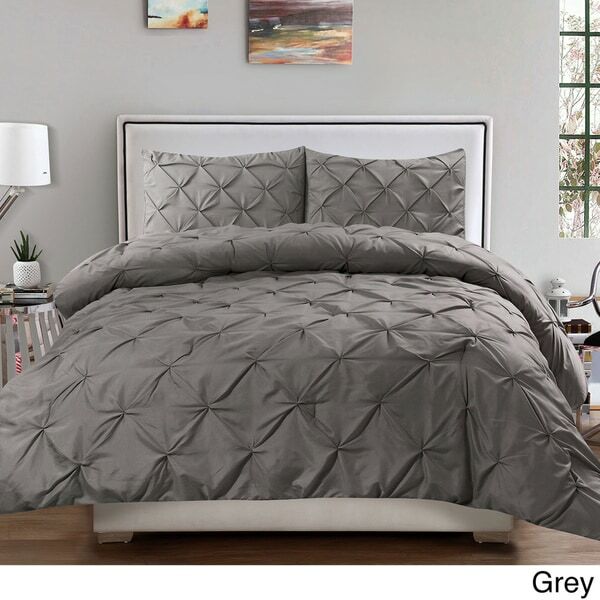 Beautifully crafted from microfiber for a hypoallergenic design, the set includes two shams and one duvet cover, embellished with pinch pleat detailing in a diamond pattern. The machine washable set is available in a variety of trendy colors to coordinate with your decor. Love this! The size is GREAT (it's replacing a too-short navy duvet cover from IKEA - that I like but am frustrated by)! It has ZIPPERS (so happy!) instead of snaps or buttons to close the bottom of the cover and for the backs of the pillow shams. Love that! It's a lovely dark lush blue and if the pinch points hold up, this is going to be a favorite for a long while. I don't usually go for microfiber bedding, but have another from Porch and Den (bought without realizing) and it's super soft, there are zero wrinkles to deal with, it washes up like a dream and doesn't seem to fade. This is a very affordable way to lush-up my bedroom. Bought this one because I really liked the "striped" Porch & Den burgundy cover I got a while back. Definitely worth it! This duvet cover is absolutely BEAUTIFUL!!! The photograph does not adequately capture the detailed beauty, softness and elegance this duvet cover. I ordered one for my sister, now I am going to order another duvet cover for my daughter . As a finicky and fussy consumer of bed linens, I was afraid to order this Duvet Cover Set. What a pleasant surprise to receive a high quality, beautifully sewn, generously sized (I bought King) product. It has the feel of linens costs 10x as much. I'm very, very satisfied. This duvet cover is so soft. The shade of gray is very nice. I love the pleats in the duvet because it adds a lot of texture with out all of the busyness of patterns. My husband and i like this duvet cover. It’s perfect for our guest bedroom. I recommend this cover if you’re looking for a simple but classy duvet cover. Love this light-weight duvet cover set. I am so pleased with this purchase. It fits extremely well and is super soft. The pinch pleats give it just that simple elegance I was looking for! Feel like I'm walking into a fancy hotel looking at my new bed ! This Duvet cover was perfect for what I needed. It was light weight, good quality, and a very nice soft red color. It fit my queen comforter perfectly. The pinch pleat design is very nice and very forgiving - when the bed is made it does not have to be perfectly smooth to look great. I would definitely buy it again. The duvet cover is lovely, and I would highly recommend it. i've purchased a similar duvet from west elm and from target, and both are far superior in quality. this duvet is see-through and paper thin. feels very cheap and not durable. It's okay, but it isn't very soft and is more decorative. Love the navy color and the Duvet is very soft. The only drawback is the hours it took me to iron this out. Came out of the package very wrinkly. 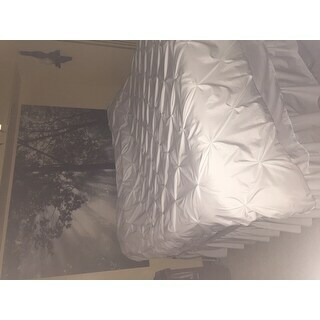 Also it was listed as a extra large queen but it fit my bed like a standard queen. Would recommend. I bought two of these sets for that fresh summer look and it simply works. Can't say enough regarding Overstock's sale prices -- Best Around! love the softness after I washed it, made the room look very updated. I love the way this looks on my bed. Very chic! Fits well over my down comforter. This is not a true burgundy color. It has an orangish hue. I washed it after receiving it and it still looks good like in the picture. I am not sure how the pintucks will hold up because they appear to have a few stitches in each pleat, but it is pretty. Would not buy again secondary to how thin the material is on duvet! But it does wash well and doesn’t wrinkle! Just feels inexpensive. It's perfect for my room. I love this. It looks great on my bed and fits perfect. I like that its warm but not too warm and its super soft. I would recommend this. In fact I bought another one of these. I love it. "In the picture the burgundy appears more of a true red instead of burgundy. Is this the true color?" This is a true burgundy. "Does this duvet have ties on the corners to hold the duvet insert in place? I realize it has a zipper on the bottom, but the ties are a must to keep the duvet from slipping to the bottom." No, it does not have the ties. There are no ties, so the duvet does slip to the bottom. "Is the pinch pleat only on one side?" Yes, only on one side. "Are there ties on the inside of the duvet cover?" Buttons that hold nicely. Great purchase, washes and wears wonderfully. There are no ties on the inside of the duvet. "do i put this cover overr my existing comforter? Is there a zipper to put it in?" You can if you like. I have my down comforter inside and don't use anything else. Yes, there is a zipper. "I just reviebed an email alert that these are back in stock, I am still only seeing 1 option when I hit the drop down box to select, I want a queen white, are they in stock? The drop down is only showing one black queen "
"Is the cream color white or off-white?" It is more of a true white. Mine is NOT white;It is cream (off white).